It has been about a year since I broke the low A on my electric viola da gamba while tuning, but a week ago I got around to ordering a replacement. Feels nice to have the instrument back in order. And I hope I don’t break more strings any time soon, just the A costs more than a full set of guitar or violin strings. The Super-Sensitive Sensicore perlon strings I use are cheap when compared to the alternatives, but still it took me a year getting around to ordering that replacement. I hooked everything up and even managed to record a short sample. Not any real melody or anything, just doodling. When I was looking to buy the instrument I looked for sound samples of the Ergo gamba but could not find any. From now on there is at least ONE sample online. The second part is just open strings. There are some effects in the loop, I might redo the whole thing with the raw signal if I find any good way to record it. www.tasset.com – Belgian music store that has free shipping on strings, and they carry viola da gamba strings. Back in February I read Witch Quest – Book II: Playing the Game by Tsugimi Wakiaka, translated into English by Ewen Cluney. Now I have played in a campaign with the game and thought I’d share some opinions and thoughts about the game. 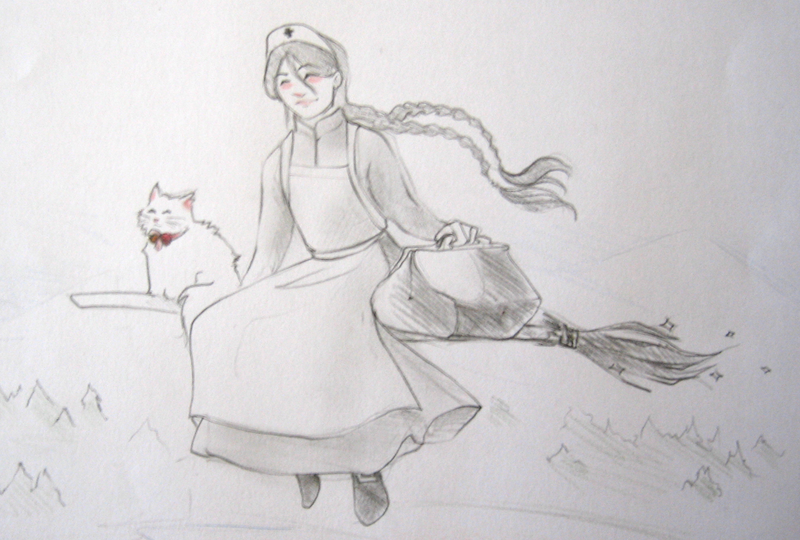 Witch Quest is played in pairs, one girl and one cat. Both the characters share one sheet so the players in each pair are naturally huddled together. Brilliant! We had four pairs in our group and if a pair was not in the focus of the story it was not uncommon that the pairs were discussing and planning their next action. And while we were eight players plus GM the game never got chaotic. Sure the story got chaotic at times, as can be expected from the genre, but the actual play went smoothly. I don’t know many games that would handle such a large group so well. The light tone of the game allowed the game to continue even if a few players were missing for session. If a full pair was missing they just were out of focus for the session. If either the cat or the witch was missing one player could play both, and we sometimes had guest players jumping in to play the cats of missing players. The simple rules helped a lot with that. I came into the game expecting ‘Kiki’s delivery service RPG’, and the first sessions were rather dull. The rules offer no special support for such a game. But halfway through the campaign we realized the game should be played as a frantic harem’s anime. The rules worked very well for that style. The rules are written in such a way that the witches are not very good at anything except casting spells (and all spells have a 1/36 chance of resulting in a spectacular and hilarious mishap). All those failures disturbed our play a lot at first, since we rolled for tasks that we wanted to succeed at. When we changed our expectations, and instead started rolling for tasks that would generate fun failures, the shift to frantic comedy took place. The game got really fun. The last few sessions emulated the genre very well and great fun was had by all the participants. wilper.wordpress.com/2010/02/18/reading-witch-quest… – The previous post on the game. verdokai.deviantart.com – Jenny did the character portrait that illustrates this blog post. Check out her gallery on DeviantArt. yarukizero.wordpress.com/2010/02/11/witch-quest-book-ii-release – Ewen’s Witch Quest translation.